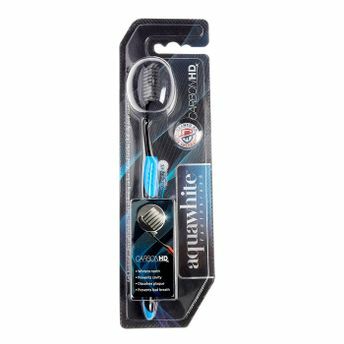 The Aquawhite Carbon HD toothbrush is designed in a manner that helps remove plaque because of carbon infused in the extra soft bristles of the brush. The design of the brush with its slim head allows the brush to reach every corner of the mouth, hence keeping them fresh and healthy. With Activated carbon present in it , it helps whiten the teeth, prevent cavities, remove bad breath bacteria and prevent gum disease. This is why Aquawhite is the most trusted oral care brand for dentists.